Tis’ the season for our belly indeed. Christmas is here and the holiday cheers bring all sorts of festivities with an abundance of food and booze and they are all compulsory. We can’t escape it because it’s that time of year, when good friends are dear and we celebrate with our loved ones. We can’t celebrate without food and a little something to drink, right? So this season, we are in for a culinary ride that comes only once a year and we have our bellies to show for it. When the season is over, come January or February, let’s not forget Sinulog is just around the corner, we will have to shed off this extra weight and steer clear from all those calories. But there is however, a new trending technique that we can try even now while celebrating this blessed season. Intermittent fasting is a fast growing fad trending among the yuppies, the millennials and xenials. In fact, there is a certain Facebook group page that has 12, 660 followers and members interacting and sharing this experience together. Intermittent fasting is fast becoming popular because of one very interesting feature, you can eat anything. Yes, intermittent fasting is a diet method without actually doing a diet, figuratively. The concept of intermittent fasting was introduced to me by my friends in high school. We recently lost a good dear friend, Mr. Cris Gopuco, a health enthusiast, a sweet soul and a loving husband and father. I dedicate this portion to you my good friend because you were always telling us to take care of ourselves, our body most especially so in turn, we can take care of our family. Dennies actually created the group in Facebook that I mentioned earlier, the one with 12,000 members, yes, he created that. We started the diet in June, Dennies, specifically June 2, and in July 28, roughly two months into the program, he created the Facebook page Intermittent Fasting and How to Cope with It. You can search for this group online and easily join by liking the page. Intermittent fasting is a concept simply stating that you divide your day into two, the eating part and the fasting. We call this the fasting window, and the feeding window. We all know that one day consists of 24 hours, so we divide 24 into two portions. This is how your level of fasting is measured. For beginners, you can easily start with 12 – 12, an even division of the 24 hour timeframe. Within 12 hours, you are allowed to eat, drink and be merry but after the 12 hour window expires, you need to cease and desist all binging activities. After the 12th hour, you must stop your calorie intake. You can drink water, black coffee, plain tea or apple cider vinegar mixture but anything other than this, is prohibited. To put it in perspective, if you do the 12 – 12 window, or IF level 1, you can start eating at 7:00 in the morning, and you need to stop by 7:00 in the evening, you can eat three times a day, Breakfast, Lunch and Dinner and a bit of snacks here and there, but when the clock strikes 7:00pm, you need to stop eating, drinking and your fasting window starts. You must not eat or drink anything except the aforementioned beverages and your next meal has to start the next day already, when the fasting window stops and a new cycle begins. Intermittent fasting only works when done on a regular basis. If you do it for a day or two and go back to your old routine, that won’t matter. Basically, nothing will happen. You will need to reach weeks or even months doing this routine before any real change will take effect. Intermittent fasting is not just a dietary trend, it is actually a way of life, a cycle that you need to maintain. Of course you can have your usual cheat days, but you need to make up for it by adjusting the fasting window. That’s the nice thing about IF, you can go back to your cycle even after your cheat day, easily and still expect results. You don’t need to go all the way back to square one. Of course, the more cheat days you have, the harder it will be to bounce back. In the FB group that Dennies created and maintains, a lot of questions and concerns are raised. Many members go to the page to share ideas, to air out issues and to clarify certain points. One frequent question that is asked is… what to eat, what not to eat, how much should I eat and other related questions. Compared to the Keto diet, IF does not restrict you between carbs, fats and proteins, you can pretty much eat anything you want, but in regulation of course. The concept is to have a full meal, but not over the normal level. Your body’s nutritional intake has a limit, do not go over it, do not eat three cups of rice a meal, do not drink four cups of soda a day and regulate your coffee intake. In case you need to go drinking and partying that’s fine. You just need to break the cycle and come back to it a day or two after. When you’ve become accustomed to level 1, or the 12 – 12 cycle, then you need to consider moving on to the level 2 and bringing your fasting – feeding window 14 – 10. You fast for 14 hours, and your feeding window is 10 hours only. Then, when you have conquered that, you can move up to 16 – 8, level 3, where you fast for 16 hours, and you eat only between the 8 hours allocation. During the time that you are not eating or drinking anything with calories, your body is resting. The food that you intake needs four hours to digest, become energy or become stored as fat. If you stop eating for a number of hours, Lipolysis occurs, this is the breaking down of fats into energy. And when your number of hours fasting increases as well, a phenomenon called autophagy occurs. Autophagy is when your intestines, your stomach and your liver is not doing anything they will actually rest and their cells will begin to regenerate and your organs will be revitalized. I want to congratulate my friend Dennies for his success going through intermittent fasting. When Dennies started in June, his weight was 225 pounds. Today, 6 months after, he weighs 165 pounds. He lost a total of 60 pounds and he had to change wardrobe from XXXL to Medium shirts. His waistline went down from 42 to 34 inches and he has a new zest in life he hasn’t felt since his teen years. Dennies is actually diabetic, it was uncontrollable as he would doze off during the day unexpectedly not because he lacks sleep but because of his HBAIC level which was at that time 11.7, the normal is 6.2. He was a walking time bomb during that time as he had seven (7) medications he had to take every day aside from his injectable serums. His uric acid was high just like his blood pressure and it would stress him out just to walk a few hundred feet. Today, thanks to intermittent fasting, Dennies has a normal BP, HBAIC and uric acid level and a new job and a great outlook in life. 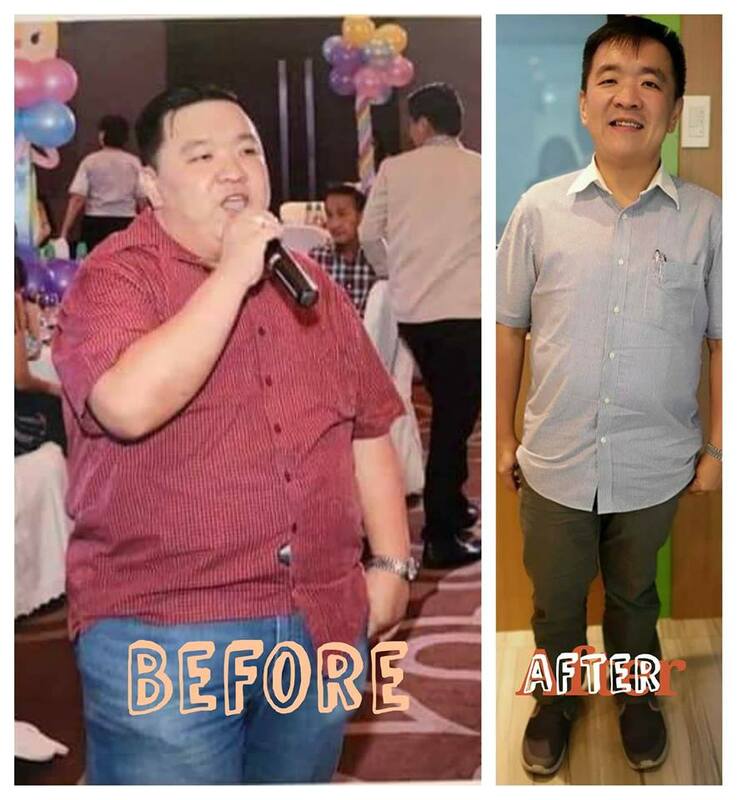 As moderator and administrator to his FB group page, he shares with everyone his struggle and his techniques to pursue his journey in intermittent fasting. As Christmas day draws near, we feel the holiday rush and we partake in the traditional feasts that come with the season. Let us not forget to take care as well of our health because just like everything else, it is a blessing and a present we can give to ourselves and our family. Merry Christmas everyone, and may the yuletide season bring you happiness and fulfillment both physically and spiritually.